In order to advance women’s rights and justice globally we need a new ecological principle that can operate at the micro and macro level and serve both the practical function of a livelihood and the aspirational breadth of a “utopia”. When Francisca Rodriguez, a Chilean feminist activist from the international Via Campesina’ (Peasant Pathway) movement, responded to this call in the AWID plenary by arguing that “food sovereignty” should be instated as the guiding economic principle and a challenge for a new economic model, she was met with resounding applause and ululations. At once an axis of rural life and a radical call for global transformation, women from across all continents – urban and rural, from the North and South – are looking to the transformative potential of this concept as an answer to the environmental ravages wrought by capitalism and a challenge to the “mercantilisation of nature” instituted by the so-called ‘Green Economy’. Today’s workshop on ‘Economic Power and Development Alternatives’ provided an opportunity to critically examine the “emancipatory potential” of this call. Peasant, indigenous and feminist activists from all across Latin America reiterated that “food sovereignty” is an organising principle so demonstrably strong that it has the potential to transform economic power. Francisca defines “food sovereignty” as a democratic extension of “food security”, “the right of people to democratically decide on their own food and agricultural systems” and produce food on one’s own land in a way that is environmentally sustainable. During the discussion, the transformative potential of the movement was explored in a rich debate: how can we tackle ingrained patriarchy in indigenous culture and combat racism towards indigenous women, asked Diana from Ecuador; how can we strengthen alliances between the urban feminist movement and the peasant movement and ensure an equitable division of labour, asked a participant from Nicaragua. Such division of labour is not always easy. In a morning workshop on ‘Social Economy and Economic Justice’, Brisna Caxaj Alvarez described how a “mixed” project to economically empower women in the region of Puerto Barrios in Guatemala through the production of soya milk was undermined by a failure to work together as equals: “the fact that they are women does not mean that the project will be transformative”, she reminded us, “we all have our own internalised biases, this is a key step that we must overcome”. A key demand of the ‘Via Campesina’ movement is a change in consumption patterns, to make the consumer part of the food production process so that she or he can identify with the food on the table. What they are advocating is not the abolition of trade, but “trade based on equality”. This model is already being put into place in indigenous markets in parts of Mexico, and there is, the women argue, space to take this model to the international level: “we can use our networks to make a new economy based on mutual respect”, argues one advocate, “a new world is possible” argues another, “I’ve seen it, I’ve been living it”. The notion of international exchange is in the heart of the food process itself following historical processes of migration, occupation and circulation. Francisca describes it as a “kind of fraternity, an interexchange of recipes, flavours and ideas”. 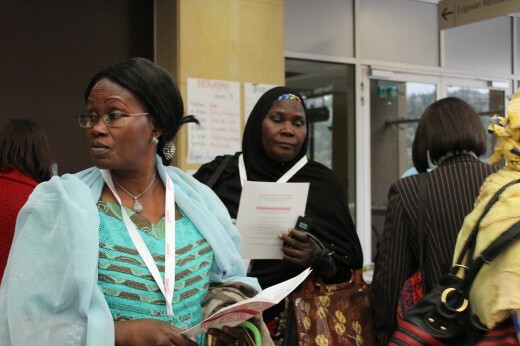 Access to the market for women who seek to earn revenue from the cultivation of natural resources is of course a huge barrier that has been discussed in depth at the Forum. Women face numerous practical problems in joining even the local market, many of which are highly gendered. These include restrictions stemming from the family sphere, such as mobility and managing multiple roles, in addition to external factors such competition with international businesses. Senegalese women’s rights activist Hélène Diof explained that a core problem faced by producers in her country is that of packaging – both for purposes of display and preservation. The incredible range of Senegalese peanut products on show at the Forum – peanut oil, peanut paste, candied peanuts – are in simple bags that cannot compete with the colourfully subsidised European imports, let alone the prices. Many women struggle in simply accessing land, or face eviction by foreign elites. A panel on ‘Women, Forests, and Plantations’ explored how such processes were impacting on women living from forests in Africa and the Americas. More than 1,200 million people globally depend on forests for survival, and for women at the Forum the forest epitomises life. In a collaborate mural created as part of this workshop, women juxtaposed Norwegian Christmas trees, British bluebells, Tanzanian predators, Australian waterfalls and Botswanan tribes. For one Ugandan participant, “the meaning of a forest for us is a place where we can have our livelihood…a place where knowledge and identity is transmitted”, “a home”: it is a physical and communitarian structure with “the potential to sustain and cultivate the transformative power of ‘food sovereignty’”. Yet from Botswana to Bolivia, new monocultures of trees – cellulose, eucalyptus, palm – are being rooted into the earth in regimented rows while traditional forests and the ecosystems that go with them are destroyed. “Women live in constant fear”, says Raquel Nuñez Mutter, from the ‘ World Rainforest Movement’ in Paraguay, “local people defending their rights are criminalised, and the most terrible and perverted thing of all is the privation of security”. Raquel spoke of one woman in Parana who was put in jail for 8 months, simply for taking wood to make a canoe, whilst members of the Brazilian “movement of people without land” are routinely beaten by the “green police” in efforts to reoccupy their land. “women are killed, women are dying for the forests” reiterated one Indian advocate to me later. Representatives from the World Rainforest Movement denounced in particular the REDD framework (Reducing Emissions from Deforestation and Forest Degradation in Developing Countries) – the means of reducing greenhouse gas emissions and combating climate change through mercantile incentives which has been advocated by the international community in past few years as part of the ‘Green Economy’. This is an attempt to “paint the capitalist system green”, argued Raquel; the forest land grabbing that has intensified under the REDD framework, under the banner of elusive enterprises such as ‘ Conservation International’ and ‘The Nature Conservatory’, is being whitewashed as part of a ‘conservation agenda’ in which capital takes priority over human life. This is a process that propagates the irresponsible notion that stakeholders can ‘compensate’ for pollution and fortifies the deadly culture of speculation in the form of carbon trading; this is the emperor’s new clothes. The impacts of this are manifested in the expansion of reserves and plantations in the global South, a process which is devastating the livelihoods of thousands of people in North Kivu in the Democratic Republic of the Congo, and in Paraná, Brazil. These were stories of struggle and resistance, told by advocates with us in the room. A complex intersection emerged in the discussion that followed: can we both transform economic power through resistance and also empower women to contribute to the male-dominated negotiations in the REDD process itself? Is this ‘selling out’ or a crucial part of the struggle? Of course the key question remains, can we really invest in “food sovereignty” as the ecological principle to take us into the 21st century? A fundamental challenge to the transformation of “food sovereignty” into a hegemonic economic power is that the world’s economies still depend on industries such as mining and oil to fund basic government programmes. In this context, how transformative can food sovereignty really be? The concept is not without political support at the state level. States including Bolivia, Ecuador and Venezuela have already included the notion of “food sovereignty” in their Constitutions, and one participant seemed optimistic that Cuba is on its way to joining them. Prospects for a broader recognition of this principle certainly don’t appear promising in the run up to Rio +20, but the stakes are high. As Francisca articulated in a session on ‘Food Security and Food Sovereignty’ on Thursday, “the question is ‘how sovereign am I?’ It’s not just food sovereignty, it’s our sovereignty, our bodies, if we look at how sovereign am I, we need to look at citizenship because I can’t be a citizen if I am not sovereign”.